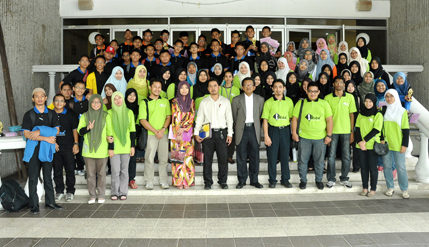 BANGI, 14 Dec 2012 – The National University of Malaysia (UKM) has for the first time given secondary school students the opportunity to carry out actual research using facilities at its campus here to enable them to experience research work first-hand. Students of Maktab Rendah Sains MARA (MRSM) Tun Ghafar Baba in Jasin, Melaka were given the opportunity for almost a week to do their experiments courtesy of the Faculty of Science and Technology (FST) of UKM. The programme supervised by FST Deputy Dean, Professor Dr Mohamad Deraman (Industry and Community Partnership), involved 48 Form 4 students who were guided by FST’s post-graduate researchers on projects that had real-world applications. Prof Mohamad said UKM, which bore most of the programme’s cost, wanted them to be competitive as well have an enquiring mind when they eventually go on to university either at home or abroad. Competition, he said, is the key to innovation which would eventually lead them to have an entrepreneurial mind with the hope that they would become inventors and innovatorsin the future. For that purpose, a competition was held for the duration of the programme, beginning on 9 Dec – the day they arrived from Jasin. It concluded today in a closing ceremony where the results were announced and trophies awarded to the winners. The students were divided into 22 projects that were proposed by the UKM researchers. The students could choose the project they wanted to do which they must complete. Among the projects undertaken were Lip Balm made from betel leaf (sireh), mosquito repellent from flowers, DNA bar-coding and extracting phosphorous from food, all very new to the students. The top prize went to the group which did the project to use super-absorbent polymers as an alternative to fertilizer. 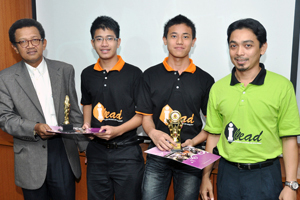 The runners-up went to students who came up with an economical way to clean plates faster without water. Theirscience teacher, Suhaili Ali, who supervises them was glad that all his charges were very enthusiastic about the projects though initiallyhe had some misgivings that some of them might be deterred by the novelty of doing something they had not experienced before. He said MRSM Tun Ghafar Baba students had taken part in Science Fairs abroad this year in Azerbaijan, Romania, Turkey, Kenya, Thailand and Hong Kong. The students will be focusing on their studies for their Sijil Pelajaran Menengah Examinations (SPM) next year.